Rémy Batteault. Since his childhood in Burgundy, Remy has two passions : cinema and musicals. Thanks to his father and his Super 8 camera, Remy has learned to love this format, in which he directed his first films. Later on, after working as an assistant director, he started directing documentaries in 1997 (among them: The Funny Face of Broadway, Charcuterie Fine, Vivre et Grandir). He’s working right now on his eleventh documentary: Super 8… My Love !, some footage for which was shot at last year’s Cambridge Super 8 Festival. Jo Comino. Jo Comino has been a film programmer at the London Filmmakers’ Co-op and a reviewer, writing for City Limits, the Guardian and Sight & Sound. She wrote and directed a documentary, Super Eight for Channel Four and has taught Film Studies at Leicester Poly, UEL and Kingsway College. She currently works for Flicks in the Sticks and Borderlines Film Festival in Herefordshire and Shropshire. Meg Jamieson. 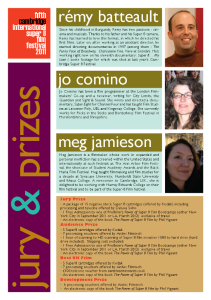 Meg Jamieson is a filmmaker whose work in expanded and personal nonfiction has screened within the United States and internationally at such festivals as The Ann Arbor Film Festival, the showcase of Student Academy Awards and the Black Maria Film Festival. Meg taught filmmaking and film studies for a decade at Syracuse University, Humboldt State University and Ithaca College. A newcomer to Cambridge, U.K., she is delighted to be working with Murray Edwards College on their film festival and to be part of the Super-8 Film festival. A package of 15 negative stock Super 8 cartridges (offered by Kodak) including processing and telecine offered by Deluxe Soho. 1 Free Admission to one of Pro8mm’s Power of Super 8 Film Bootcamps (either New York City in September 2011 or LA, March 2012) exclusive of travel. 1 hour of scanning to HD scanning of Super 8 film in native 1080 to hard drive (hard drive included). Shipping cost excluded.